First, it was Dan Rooney. Now, Barack Obama has called on another member of the Pittsburgh Steelers family for a post in his administration. 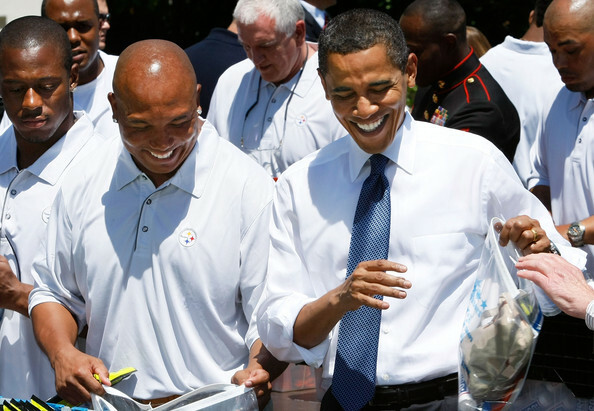 The White House announced Thursday that Obama will name Steelers WR Hines Ward to the President's Advisory Commission on Asian Americans and Pacific Islanders. The commission coordinates with government agencies to get more Asian Americans and Pacific Islanders to take part in federal programs for businesses, agriculture, economic development and several other fields. Ward, born to a Korean mother and an African-American soldier father, has been a very visible and vocal advocate for mixed-race children facing discrimination in South Korea. Ward's philanthropy has grown by leaps and bounds over the past few years. His Hines Ward Helping Hands U.S. Foundation focuses on improving literacy among children and will provide programs and services to better equip them for achieving and handling success in life, while abroad his Helping Hands Korea Foundation (formed as a tribute to his mother) has targeted biracial discrimination, especially as it occurs among the children of Korea. You can meet the other distinguished members of the newest team Ward will be joining on the official White House website. And congrats to #86 on this appointment and honor. Of course, this is what Pittsburgh's all about: Being a lapdog to the labor union tool that is Obama. Of course, the Burgh doesn't have any jobs to destroy, but hey, we're still union strong. We don't have anything else to do, like go to work, but it's a nice gesture nonetheless. Regurgitate your Tea Party/Fox News slander elsewhere.